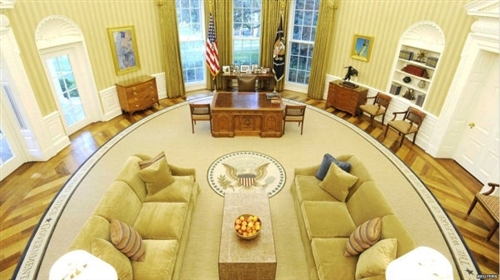 White House Gift Shop’s collection of fine wood furniture and office accessories will give your office or home study Presidential gravitas with collectibles or gifts symbolic of the Oval Office. 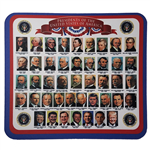 We offer Presidential and White House office accessories from pens, portfolios, customized paperweights, Air Force One models to décor that includes a 1792 Cornerstone Commemorative White House Clock. These accessories are also great to give as gifts to diplomats, friends, family, and, of course, for young “future presidents” in your family to stimulate imaginations or as school supplies. The White House two piece roller ball pen with sleek black lacquer finish and 24KT gold-plated trim has a sleek profile with a substantial presence and smooth black ink flow of a $120.00 or more pen with the added distinction of a black presentation pen box with a gold embossed seal. Visit our Pens & Pencils section to view these and more of our excellent writing implements. The Washington D.C. Commemorative Optical Quality Solid Glass 3-D Hologram Cube with White House, Capitol & Memorials with Titles: Plays Beautifully with Light, 1.2 Pounds, 3" x 3" x 2"
NEW Great Seal of the United States Black Lacquer Roller Ball Pen Set of 2, Capped Pens w/24k gold laser image and accents, Presentation Box, Precision Writing, Our most popular pen!